Every artist knows the magic of an idea suddenly hitting when least expected. Often these serendipitous thoughts form the basis on which to create, often something new and adventurous. They help push out new creative frontiers and make one think in different ways. Sometimes it is an idea that reaffirms a direction on which one is embarked already. Other times, it awakens curiosity and suggests new lines of investigation. Let me give an example. My fascination with silverpoint drawing led me, just recently, to marvel at a displayed copy of the huge and wonderful St. John's Bible. This work of art and devotion was created by a team of artists and theological scholars at the Benedictine St. John's Abbey and University in Collegeville, Central Minnesota, under the leadership of Donald Jackson, Scribe to Her Majesty's Crown Office at the House of Lords in London. Fulfilling a life-long dream of creating a modern illuminated Bible, linking ancient spiritual texts with the 21st century world, he was eventually commissioned in 1998 to create the St. John's Bible. Its final lines were penned in 2011. The resultant, magnificent creation, 2 feet by three when the Bible is open, is written by hand on vellum, with 160 illuminations, each one of which is absolutely mesmerizing. These are just some samples to incite you, I hope, to look at more of them and see them in real life if you get the chance. I loved looking at the amazing illuminations on display, but behind my fascination lay two questions: Did the artists draw the illuminations out in silverpoint before they painted them with tempera and inlaid gold leaf, as happened in medieval times? And did Mr. Jackson lay out lines on which to write his text with leadpoint, as did the early monks? I was able to ascertain that no, neither silverpoint nor leadpoint were used in this creation of the St. John's Bible. So that made me wonder about other frontiers. 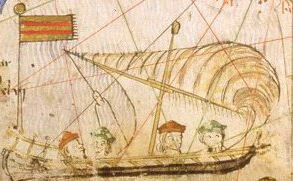 Now I need to find out about some other amazing creations - the extraordinary portolan charts and nautical maps created in the 14th century by the preeminent Mallorcan map makers, among whom Abraham Cresques and his son, Jehuda, were the most renowned. Since all those early, early maps arose from the monastic tradition of illuminated manuscripts and were often created contemporaneously to the Books of Hours and other sacred works, I suspect that indeed metalpoint came into use during the maps' creation. But I need to hunt further to confirm that. When you gaze at these complex works of science and beauty, the 14th century equivalent of Google Maps for the seamen of that time, large charts created painstakingly on vellum, it is with the same amazement as I experienced with the St. John's Bible. But now I need to find out if those artists drew their illustrations and lines with metalpoint. All wonderful thoughts of how to go on exploring metalpoint drawing, a medium of antiquity equal to the early medieval religious bibles, of exactitude for exploration of aspects of the natural world and, at the same time, a medium of wonderful possibilities for today's artistic voices.